Once marching band season ends, percussionists have the opportunity to participate in our Winter Percussion program. The Winter Percussion ensemble meets from late October to late March and learns a competitive percussion piece to compete against other schools in Indiana. Winter Percussion is a critical component of student musician training, and it provides an opportunity for percussion members to perform in a manner that highlights their instruments. 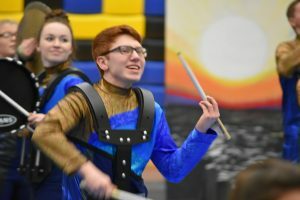 During the Winter Percussion season, students perform a show between 4 to 6 minutes in length that is performed at competitions across Indiana. Would you like to support the Jay County Bands? If so, you may make your donation here! © 2019 Jay County Marching Patriots. Theme by XtremelySocial.